Tim: Welcome back to Living with Money. This is Tim Mullooly. On today’s episode, I am joined by Ryan Wright. 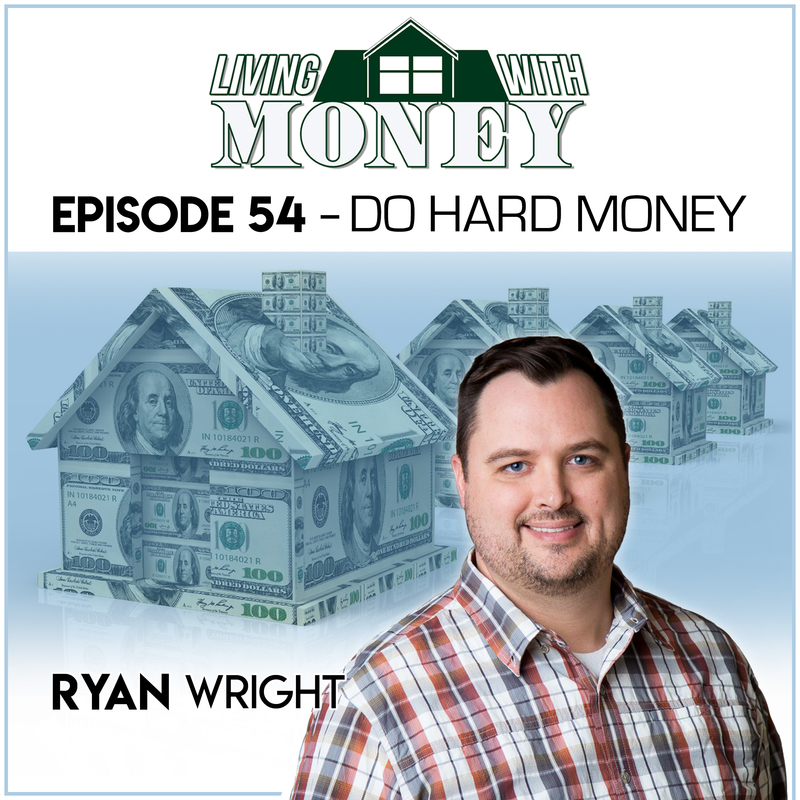 Ryan is an entrepreneur, a real estate investor, and the founder and CEO of Do Hard Money. Ryan, thanks for coming on the podcast. Ryan: Well, thanks for having me. I’m excited to be here. Tim: So, let’s just start with the basics for the listeners out there. Can you just provide us a little background about yourself, how you got started in your career, and kind of how you got to where you are today? Ryan: I have a lot to be grateful for. I grew up in a household where financial principles and cash flow and different asset classes were something we talked about at the dinner table. So, I tell people I grew up in the real estate business because I really did. I’m kind of a third generation. My grandpa started fixing, flipping properties on the side while he was a HVAC contractor in southern California. My dad was a chiropractor and knew that passive income was king and started buying rental properties as my grandfather bought rental properties before him, and I grew up fixing properties and seeing investments and that type of stuff since I was a kid. So, I didn’t really know any different. So, I decided to become a real estate agent and did that and was very successful with that. I got into my own rentals and from there, I helped other people fix and flip properties because I was so risk-adverse and scared, and then I started flipping my own, and then we got into the money side where we were lending money from a real estate investor’s perspective, not a banker’s perspective, which has grown into a large organization today. We’re now doing a lot with tools and resources, software and ways we can make it easier for people to get involved in the real estate investing world, either from being the finder and the fix and flipper or from being a funder that’s bringing capital and getting higher than typical market returns in doing so. So, that’s in a nutshell. Tim: Nice. So it was kind of just a nice natural progression for you from growing up surrounded by real estate, just kind of getting immersed in that throughout your life? Ryan: Yeah. It’s just kind of like doors open. If you’re a hustler and you’re out there doing things, then new opportunities present themselves. One of my real estate customers that we’re helping liquidate properties for was an investor, and he liquidated a whole bunch of property and said, “Here’s several million dollars. I like you. What do you think you could do with it to get a good return?” It was like, “We can lend it,” and that took me down a whole other avenue. So, doors open if you’re out there doing the right things. Tim: Right. Do you want to talk a little bit about how Do Hard Money got started and what you do for your clients? Ryan: Yeah, yeah, absolutely. The story I just alluded to was kind of the beginnings of that. I had an investor that was liquidating properties, so I was a real estate agent and I was helping him sell these properties. And so, he’d have a property, we’d get on the market, we’d get it sold, and then three or four months later he’d bring in another house, say, “Okay, now I want you to sell this one,” and we’d get it put on the market and get it sold. Let’s step back. I mean, hard money, some people are like, “Oh, that sounds scary,” or, “Sounds loan sharky.” The idea with hard money is really just we’re lending on the hard asset rather than the soft asset. So, the soft assets are going to be debt to income, how long they’ve been on their job, how much money they make, those types of things. Those are considered soft assets. For a hard money lender, we just lend on the hard assets. We just say, “What’s the property worth? How much under that worth of property can we lend so that our security’s in the property, not the person?” So that’s really the nut and bolts is we care about the property, not really the individual. We have a few things we care about the individual but they’re so few. That’s kind of the idea of the hard money. And so we started doing some lending and we came at it from an investor’s angle, not from a banker’s angle. Banks don’t really understand nor can they actually lend on properties that are in need of work, and that’s one thing a lot of people don’t understand is, “Why don’t you just go down to Chase or Wells Fargo?” I’m not trying to name names, but any of the big banks that are out there, “Just go down there and get a loan.” Well, if the property condition doesn’t meet a certain document of all the things it has to be done, then you can’t. So if it is in need of repairs or if there’s wood to earth contact or if the sloping isn’t away from the property, or any of those types of things, and the house has to be sold for cash or has to be brought up to the condition you can go to one of the big banks and get a loan. And that’s really why this whole industry exists is there’s properties that don’t meet a certain condition, they can’t be sold with a traditional loan, so either the owner has to fix the property up so they can then sell that and the buyer could get a traditional loan, or they sell it to an investor who’s then going to put in the money and they will then sell it to an FHA buyer, someone that’s going to go get a loan from the big banks, and that’s how it works. Tim: When you were saying you lend on the hard asset as opposed to the soft asset, is that more just because the houses are sometimes more … If I don’t know if reliable is the word, than a human being, but is that the case why you just go after the hard assets and not the soft assets? Ryan: Yeah. It’s a traditional just an equity play, right? Is there enough equity in the property that if we had to take this deal back, we could sell it and make our money and be covered. And if there’s enough equity in that, then it makes sense for us to do the deal as long as they’re not in the middle of a bankruptcy or foreclosure or have collections, some of those minor things, but regardless of credit scores. So yeah, so for us, it’s just a different way. Banks don’t look at things that way. I think obviously, FHA loans that a bank’s underwriting is really, really safe because they have so many criteria. Your debt-to-income ratio can’t be over that. You have to be on the job for two years. You can’t have any blemishes on that. So there’s all these criteria so they’ve made this box and they know if it goes in this box, they’re going to have a certain percentage of those. The vast majority of those will succeed. When you’re dealing with investors, the problem is that property doesn’t fit any of those boxes, so then what do we do? So rather than looking at those soft assets, we say, “Hey, is there enough equity in here that even if things go bad, we’re going to be fine? Great, let’s do the loan.” So it’s an investor way of looking at a deal rather than a banker’s way of looking at the deal. The banker wants to have this person that has the perfect job and all the credentials. We don’t care. The funny thing is, a traditional, like an FHA loan is going to lend 95% of the purchase price. I’m going to lend 65% of what the property’s worth. They’re lending 95% of what the property’s worth and I’m lending 70%. So that’s the difference, and so they get the soft assets of somebody that’s going to repay and do those things and I’m saying … Real important point here that I should’ve clarified earlier. The loans and things we’re doing are not to homeowners, so we’re not doing homeowner lending. We’re lending to investors and that investor is then going to sell it to somebody who’s more than likely going to move into the property or keep it as a rental property. Tim: Right. For someone who has never before in their life invested in real estate, how should someone go about getting started in that space? What do they need to know before they get started? Ryan: There’s lots of ways to invest in real estate, so that’s probably the number one thing. I mean, you can invest in real estate from buying raw land, which I’m not a fan of. You can invest in real estate by buying REITs or buying into funds that are investing in real estate, specifically commercial properties or whatever the case is there. You can then just go buy a rental property. You can buy duplexes. You can buy single family houses. You can buy an apartment complex with multi, a small apartment complex with 4 or 10 or 20 units depending upon what you’re looking for. There’s this whole other side to real estate investing that is usually misoverlooked, and that’s being the lender. That’s kind of where we come in with something. We have two different clients, people that need the money, and so we help them and we structure the deals right, and then we have people that have money and then we match the two of those up and underwrite the deal and service the loan. There’s this whole element of what’s called hard money or private money lending where you’re able to lend the money. You don’t have to deal with the repairs or the maintenance or those things, and then when the property pays off, you get paid back. So there’s lots of ways to do that. I think it really just depends. Tim, there’s really not a one size fits all, like you guys do. You sit down and talk to everybody individually about their financial plan and goals and what they want to accomplish, and depending upon your age, depending upon your goals, depending upon your net worth, depending upon how much cash you have, those things, you come up with a plan. So it just depends on where you’re at. I would say it makes a lot of sense. Rentals make a lot of sense. They have lower returns, but they make a lot of sense, and short-term lending like we do makes a lot of sense because you’re getting a really good return on your money, but you are having to find a new loan every six months or every year to replace the one that just got paid off. So, you’ve got to balance that as well. Tim: Right. So just the first step of understanding all the different ways that you can invest in real estate and determining which one is correct for your individual needs and wants and what you want to get out of it. Ryan: And there’s active and passive investments. I mean, you could go buy rental properties with what’s called a turnkey company. A turnkey company finds properties, fixes them up, sells them to an investor, and they manage the renters, so they have a management company and they just cut you a check every single month. So with those deals, sometimes you can leverage. Sometimes you can get a loan, put some money down, and own that property, and sometimes you just want to pay cash for that, so there’s that aspect that you can look at. And then you can do loans similar to what we do on your own, as long as you know the right things to do so you don’t lose money, or you can find a company like us that can help you or you can put your money into a fund that does things like we do where you’re in a whole bunch of deals but you have less control. You don’t get to say yes or no on specific deals. So, I’m always a fan of having a little bit more control or watch over your money. It just depends on how active or passive you’re looking for, as well. Tim: Right, definitely. So I’ve read that you’ve said flipping houses is simple but not easy, which sounds kind of too similar words there, but do you want to explain what you mean by that phrase? Tim: Simple and easy are usually the same thing, right? Ryan: No, they’re not. I think the big thing with this is if you’re wanting to buy a piece of property, fix it up, and resell it, it seems really, really simple, right? So the idea is, I go out there and find a property. Okay. Once I find the property, I fix it up. Okay. Once I fix it up, I sell it. Okay, three simple steps. Done. Simple. Right? And then after that, you’ve got to know, hey, I got to make sure I value the property correctly, and how do I learn how to value properties? What will this be worth? I got to learn how to know what construction to do the property and what not to do. I got to learn how to hire those right contractors and hold them accountable and make sure they don’t go over budget, and then I got to make sure I resell that property. There are hundreds of steps in between each one of those three simple steps. One other thing is all of the TV shows out there have glamorized house flipping. I mean, it’s everywhere. I start eating something and they found the house by the time I take my first bite. By the time I finished eating my main course, the house is already remodeled and by the time I’m having mint chocolate chip ice cream for dessert, they’ve got a $50000 check in their hands and it’s all over and it took 17 minutes and 32 seconds. So I think that’s where this whole simple thing kind of comes in is like, “Man, it’s so simple,” but it’s not easy. It’s those little steps in between that make the difference of having wild success and not doing well or even failing. It’s those little steps. Tim: As you were saying that, I was picturing kind of an HGTV type show in terms of picking a house, fixing it up, flipping it. To your point, if it was that easy, everybody would be doing it, right? Ryan: Yeah, absolutely. I mean, the real show in this, the show is not in the show, right? The real show, you could do documentaries about finding the good deal, right? You could follow a guy around and be like, “We’re going to go find a good deal.” Oh man, you’re talking weeks, months before that could happen if they were actively doing things. And it doesn’t need to be a full-time thing. It just takes a lot of effort, takes a good plan. It takes a lot of effort. It takes having some software and some tools in place. You could drive by a great deal and not even know it was a good deal because you missed it because you didn’t know what to look for. You didn’t know what you didn’t know. So, those are some of the big things, and don’t get me wrong, we all love the TV shows. They’re a blast to watch. They’re great. Ryan: But it does make it seem really easy, and it’s simple, but it’s not easy. Tim: Now I understand what you mean by that phrase. So speaking of having a good plan, in terms of a person’s overall plan or portfolio of assets, do you think that everybody has room for at least a portion of that to be involved in real estate? Ryan: Yeah. I mean, I do, definitely, but I’m a real estate guy. I’ve done stocks. I’ve done different types of things, but I’m a real estate guy. I’m a tangible guy. I like the asset. I like to be able to know it’s bricks and sticks, and yes, I think so. The nice thing now with the money lending, these types of things like we’re doing, you can have the best of both worlds. I call it real lock investing. You can have the real property, but you can have the benefits of real estate and the benefits of stock kind of combined. You own the paper. You don’t own the real estate, but it’s backed by the real estate so you can have both. So I believe it is. The issue really is there isn’t any more land in America. There is what there is. And so we’re always going to have these ups and downs with the real estate market, but overall, the trend line is just heading in one direction. When it comes down to problems in economies, when the worst things happen, people need places to live. That’s just kind of a basic necessity. Now, that’s not to say we didn’t have deals that went bad. It doesn’t mean to say we didn’t foreclose. It doesn’t mean to say we lost money on deals, but if you took that all together as a whole on their individual portfolios, it’s like, hey, this worked out really well compared to everything else that was out there, and that actually helped us on a trajectory as we went through that crisis, not that it was the funnest thing to do nor would I want to go through it again. I don’t think we will go through something like that again. So many things have changed, but it really helped us know what to do. So to answer the question, yes, I think not putting some type of a real estate into your portfolio on some level, you’re probably doing yourself a disservice. Tim: Right. So, would you say that in a sense diversifying away from stocks, bonds with a portion in real estate and also that tangible asset that you were talking about, would you say that those are some of the main benefits of having a portion of your assets in real estate, and what would you say are some of the other benefits of having real estate in your portfolio? Ryan: Yeah, I think the security and control, I think the nice thing with the tangible asset or the real estate is there’s a higher degree of control. I don’t have a lot of control what the CEO of Apple does or the CEO of Amazon does. I have a lot of control over what happens on my single family rental house, right? I can spend more money on it and finish the basement and rent it for more money. I can do capital improvements, increase the rent. I can not do capital improvements and rent it the way that it is. I just have more control over that. If you don’t want to be in the management business, you can hire a manager or you can get into the lending side of that where you have more control over, “Yes, I want to do this,” or, “No, I don’t want to do this.” So those are some of the big things that I think controls visibility and having a tangible asset rather than just paper. At the end of the day with the stock market, there’s not a lot you can do to change the outcome of the stocks or bonds that you own going up or going down. You could go shop on Amazon like crazy but I don’t think that’s going to help. Tim: Nope, not too much, yeah. You started out as a real estate agent and got involved in real estate investing and lending. Do you think that other real estate agents should also become investors themselves? If so, why would you say that that would be a good idea for them? Ryan: 100%. I think it’s really become your own best customer, real estate agents, if you’re listening to me, and same with general contractors. I mean, that’s kind of my grandpa’s story, right? It’s like become your own best customer. It’s so great. I mean, the example from my grandfather, it’s like hey, doing HVAC work, have some guys, they have downtime, he buys a house. When they have downtime, he puts them to work on that. He’s already paying the payroll anyway. He gets the benefit out of that, and then he’s able to sell the property. He’s able to save on services and costs and all that type of stuff, so it’s like become your own best customer. That’s really where financial freedom happens is developing and understanding what you need and working backwards from that plan and saying, “Okay, I want this percentage on this and this percentage on this and this percentage on this,” and then working towards getting there. And surprisingly, whether it’s with the things we do or the things that you guys do, if you sit down and put a plan together, you can typically get there a lot faster than you thought you could without having a plan. Tim: 100% agree with that. So you’re kind of just playing on your strengths there for a real estate agent. You’re already helping other people look for places to live and you might as well use your strengths in that field to also help yourself a little bit, too. Tim: So, over the span of your career, you’ve probably dealt with hundreds if not thousands of mortgages and properties. In your experience, what would be one or a few common reasons that a property might not be approved for a more traditional mortgage? Ryan: So there’s lots of things. So if they’re getting an FHA loan, which is most loans that people are getting to live in the property, the appraiser’s going to go through the property and there’s several things. Number one, they need to make sure that the roof is going to last at least five years from a visible inspection from the ground. If there’s any signs of anything where the roof won’t last five years, it cannot get an FHA loan. The termite inspection has to be done. If there’s any termites, even if the damage can be fixed for a few thousand dollars, it cannot get a traditional loan. If there’s what’s called wood to earth contact, meaning any of the wood from the side of the housing is touching dirt, it cannot get an FHA loan. If there’s sloping towards the house rather than away from the house, it cannot get an FHA loan. If there’s any concerns with the HVAC system, if it looks old or it looks like it might not be able to use from a visual inspection, if it looks rusted out, cannot get an FHA loan. There’s pages. I downloaded this just the other day. There’s like 12 or 15 pages line by line that goes through where they have to say, “Okay, that’s good, that’s good, that’s good.” Now, this isn’t a home inspection. This is going to be the appraiser that’s doing a visual inspection that has to check the box saying, “It looks good to me. It looks good to me,” and so that is required. So those are some of the big things that you’re running into. Tim: Right. So you were talking before about how hard it is to find good deals in terms of finding properties to flip, stuff like that. It’s not as easy as it looks on the TV shows, but what in your opinion makes a property a good candidate for flipping? Ryan: Yeah, great, great question. First and foremost, you’re going to have the most success in going after properties that are FHA or less loan amount. So, you can just Google, “What’s the FHA loan amount for,” wherever, Cincinnati, Ohio, and it’ll tell you, “Hey, FHA loan amount is $321 and 13 cents,” whatever it is. That basically means that FHA will not loan more than that, and that’s really big because most of the buyers are going to be under that amount. The second thing you want to be doing is saying, “What is the median price range of this area?” You can Google that as well and find it in a lot of sources. “Okay, so FHA’s 321, but the median price range is 250. Great. I want to be 250 or under on my price.” So that puts a max price you should be looking after. In the same regards, you don’t want to be dealing with the minimums. So, you want to make sure that the property’s going to be worth at least $75000 once it’s fixed up in most cases, in most marketplaces. The other thing you can look at is appreciation in the area, demand in the area, days on market. One of our killer software, you can look at all these things with heat maps and know are prices going up, is it taking longer to sell, is there more inventory, less inventory, that can help you decide on areas or zip codes, then you can say, “Okay, that’s an area I now want to be investing in.” There’s enough demand, and then from there you start putting some targets together of people to go after. Tim: It sounds like there’s a lot involved in that process of deciding what’s a good property to flip. What would you say is the hardest thing about the entire process of flipping a house for someone? Ryan: I really have to say two things. The one is, making the commitment to do it, and number two is following through on that commitment. I mean, it’s one of these things where it’s just like anything new. If you’re learning how to snow ski for the first time, you’re going to fall and get hurt a couple of times. If you’re learning how to ice skate, whatever the case is, it takes time and so lots of people because of this, simple versus easy type thing, a lot of people just think, “Oh man, I ran into a roadblock. I’m going to give up,” and that’s not the thing to do. So, I think making the commitment and following through on it, and again, there’s two sides to this. There’s the, “I want to go flip a house and be an investor,” side, and then there’s the financial investor side of saying, “I’m just going to put up the capital.” So with this, we’re really talking about the guy that’s going to go out there and find that property, and it’s just making the commitment and following through on the commitment and recognizing there’s going to be some challenges along the way. I say it all the time. The best real estate investors are the best problem solvers. It really comes down to, “There’s a problem. I can help you solve it. I’m a real estate problem solver.” That’s really what it comes down to because whoever can solve the most problems is the most successful investor. It also helps. I mean, some people see things, say, “Oh, they’re just taking advantage of a little old lady and taking their house.” No, that’s not the case at all. I mean, I had a deal recently where it was a guy. His wife had died, and he was in the house and the family, they needed to sell the house because he needed money to go into a home and they didn’t have the money because they were short and blah blah blah. That’s a real estate problem solver mentality. They fully know that as a real estate investor, I’ve got to make money on this deal, and so I’m pretty upfront about that, “Hey, we like to make 10 to 15%. That’s really what we’re going for, but we have all these other costs. We have the cost of money, the cost of rehab, the cost of agents, the cost of insurance,” all these things, and then, “This is basically what we can do. This is what we think it’s worth. This is what we can pay you based upon those numbers. If that works for you, let’s make something happen.” So it’s a real estate problem solver mentality. Tim: And I doubt that there’s ever been a real estate property that has never had a single problem, right? Tim: Right, exactly. So we were talking earlier about the difference between real estate and stocks and bonds and how that all works together in a portfolio for someone. Compared to the stock market, what makes a peer-to-peer real estate loan secure? Ryan: Yeah, so it’s really going to be the asset of the property that’s going to make that secure tie. So when we talk peer-to-peer, there’s really a couple of different types of peer-to-peer. Peer-to-peer can be many-to-one or it could also be one-to-one type ideas, so there’s a lot of peer-to-peer where it’s “Hey, everybody throw in 50 bucks and we’ll take that 50 bucks and then Billy’s got enough money to start his business,” or whatever. That is peer-to-peer. When we’re dealing with a real estate type thing, you can get involved in deals where you’ve got multiple people into a deal. We typically do it where it’s one-to-one peer-to-peer, you’re putting up the money, this is the guy that’s doing the deal, you own 100% of that. Tim: Yeah, that makes a lot of sense. So I’ve also read that you said you feel it’s better for someone to direct their own 401K. Do you want to explain a little bit that idea for the listeners out there? Ryan: Yeah. The reason why a self-directed 401K is so popular in my world is because you can take that self-directed money and you can put that money into loans. You could do a loan with that money and get a 12% return, 15% return. The nice thing about doing the loans is the interest rate that the borrower promises to pay that doesn’t always end up that way is pretty defined. So, hey, this loan is at 15% interest. Wonderful. I’m going to get 15% of interest on my money as long as there’s not a problem, so that you know what you’re getting into, whereas when we’re dealing with a stock, you have hopes or projections of those things of what it will do. You don’t really know. The nice thing is with that real estate, you know what that rate of return’s going to be because it’s established upfront and as long as everything goes according to plan, it’ll be there. Now, it doesn’t always go according to plan so you make some accommodations. Sometimes if we take a property back, we make more money than we were planning on. Sometimes we take a property back, we make less money. On occasion, you might lose a little bit of money. That’s kind of part of the whole game as well, but you’ve got to look at all of the deals as a portfolio and not just individual every single one. Tim: Over the span of your career, you’ve also written a handful of books. One of them was titled The Most Powerful Secrets in Getting Short Sales Approved. Do you want to talk to the listeners a little bit about that book and maybe clue them in to one or two of the secrets that you dove into in the book in terms of getting short sales approved? Ryan: Yeah, absolutely. So, I wrote this book right after the 2008 financial crisis because really what happened is with all these properties … And just to back up, what is a short sale? A short sale is where the bank decides to take less than what’s owed on the property in order to liquidate the property. So, what they do is they take that and they plug it in and they’ve got different databases and systems and they decide, “Hey, is it better for us to foreclose or is it better for us to take the offer we currently have?” If they think it’s best, then they accept that short sale. They don’t own the property. The seller owns the property, but they’re in default. The seller accepts it. The bank gives a letter of short sale approval and at the closing table when they get funded, the bank accepts less than what they were supposed to get on the deal. Now, that doesn’t mean that the bank is losing money. They actually might be making money. It may be interest and fees and costs and everything else, and if the bank is losing money in lots of instances, if it’s a bigger loss, they have insurance that insures them if they’re taking a loss above a certain amount. So, that’s the other thing that happens in this equation is lots of banks are ensured around taking some losses or they take the first portion and somebody else takes the second portion of loss. And so that’s why some of these approvals need to happen. I mean, if you want to talk about some of the secrets on that, it really comes down to putting together a good package and following up aggressively with whoever the service provider is to make sure that they’re actually listening to you. It’s putting a good plan together of what … One of the most difficult things in getting a short sale approved is making sure that the asset manager understands the condition of the property. So what we would do is we would get third party agents out there to take pictures and send that in with values. We would also get contractors to go out there to say, “Hey, we think the property’s worth this, but it needs all this work to it. Here’s a bunch of pictures of the property. Here’s contractor bids.” So there’s three or four secrets that will help in getting a short sale approved. Tim: Right, exactly. There’s a lot of good information there about short sales, because I feel like it’s a term that a lot of people have heard but they might not know the exact mechanics of how it works. Another book that you’ve written on the topic of short sales was titled Seven Short Sale Myths and How to Overcome Them. Without giving away all seven myths, do you want to talk about maybe one or two of them that you’ve come across in your career that you put into the book? Ryan: Yeah, absolutely. Let’s be clear. There’s this whole idea of short selling stocks. This is not what we’re talking about here. Again, this is getting a bank to take less than what’s owed on that property. And so I think one of the biggest mistakes that people are making, I alluded to it a little bit earlier, is their communication or the way that they communicate with the asset manager. So, you got to start early. So one big mistake a lot of people make is they don’t start working with a bank until after they have an offer in hand. So, you actually want to start communicating with the bank as soon as you put the property on the market. Finding out who the asset manager is, sometimes that can take weeks of a process or even a month of a process making lines of communication open with him before you actually get an offer so that by the time you get an offer, it connects. Offers don’t wait around, so if a buyer makes an offer on a property, he may be gone a couple weeks later because he gets restless because they’re so emotional and excited about, “Oh man, we’re going to buy a house, we’re going to buy a house. Oh, we haven’t heard anything, we haven’t heard anything, we haven’t heard anything. Well, let’s go look at some other houses.” By the time you hear back from the bank or the asset manager, they’ve bought another house, so getting communication early is the number one thing on one of those secrets. The other thing is putting this package … We talked about putting this package together and making sure you help the bank understand and then communicating and helping to problem solve. Tim: That’s not going to get you anywhere. Ryan: I mean, it should go without saying, but it’s probably one of the secrets to everything in life that people keep disregarding. Tim: I feel like from what you described, it sounds like it could be a potentially frustrating process, so it should go without saying, but just remaining calm and remaining nice would probably go a long way for some people. Tim: Yeah. So, I’ve got one more question for you before we wrap up. I like to ask all the guests before they leave, whether it’s personal or professional, what’s one piece of advice that you’ve gotten in your life that’s always stuck with you? Ryan: When I was in high school, I got an award because I ran a little company. I started a little carpet cleaning company and sold that and started doing floor mats. I was a finalist for the Governor’s Young Entrepreneur Award for the state of Utah. So, I got to ask him a question, and just think of the guy that owns a professional NBA team, like, let me ask him a question. What are you going to ask him? So I asked the broadest question, like, “Larry, what’s the secrets to success, the biggest secret to success?” It seemed like the question you’re kind of asking me, like, “What’s the best advice you ever got?” So it’s a loaded question. Tim: It sounds so easy. It’s so much deeper than just arriving. It’s making the decision, being there, and then show up on time. Be prompt. Make sure you’re there for the calls. Make sure you’re getting the education you need, and then show up prepared. If you do those things, you’re going to beat out so much of the competition. You’re not always going to win the deal. You’re not always going to win the contract, whatever you do for a career, living or anything else, but in the end this advice is transferrable to everyone and is a lesson I preach quite heavily. Tim: Like we were just talking about, just being nice and being prepared and being on time, these are little things that you think would be so easy that everyone would do it, but you’re absolutely right. I mean, just doing those small things puts you so far ahead of majority of people out there. It’s crazy. Tim: But then when they actually do show up on time, you’re over the moon happy about it. Tim: It just shows how far a little thing like being prepared or being on time could go for you. Ryan: Absolutely, and just showing up. That’s for most things in life. You’re thinking about real estate investing, you got to decide and actually show up and start being a real estate investor. Tim: Absolutely. Well, Ryan, that was all the questions I had for you today. Thanks so much for coming on the podcast. I really appreciate you taking the time. Ryan: Absolutely. It’s been great to visit with you. I love the questions, and really excited to have the opportunity so thank you, Tim. Tim: Anytime. So for the listeners out there, we’re going to link in the show notes to the two books that we mentioned from Ryan. We’ll also link to Do Hard Money’s website as well, where you can learn even more about the company and more about Ryan. So thanks for listening to this episode of Living with Money, and we’ll catch you on the next one.